In addition to trees, shrubs, flowers, and other types of plants, a residential landscape may require the addition of decks, outdoor kitchens, irrigation, pools and spas, structures, and children's play areas. A landscape architect is someone who can design all of these elements and integrate them into a logical and visually appealing plan for your property. A landscape architect will also determine the best way to incorporate lighting, hardscape, and plants (softscape) into your outdoor spaces. This person (or firm) should be able to design outdoor structures, know how to deal with site issues and challenges (like drainage or slope problems), and will be able to advise homeowners on locating driveways, parking areas, entries, and locating service lines. This professional is familiar with building and landscape materials and services, and should be able to work within your budget. They also design parks, campuses, streetscapes, trails, plazas, and other projects that help define a community. Currently, landscape architects are working with medical professionals to design landscapes that help reduce stress, boost immunity, promote physical activity, and cut down on time spent in hospitals. Green roofs designed by landscape architects can reduce air temperatures by nearly 60 degrees in the summer, helping to save energy costs while cleaning and storing rainwater. They also offer habitats for pollinating birds and beneficial insects. Landscape architects can charge an hourly rate or provide a complete package for the homeowner, from conceptual plans (plan-view drawings or sketches) to construction blueprints and supervision of the actual installation and building. Fees that are charged will depend on the scope of the project, how long it takes, materials, other professionals involved, site challenges, and the amount and degree of supervision that will be needed. 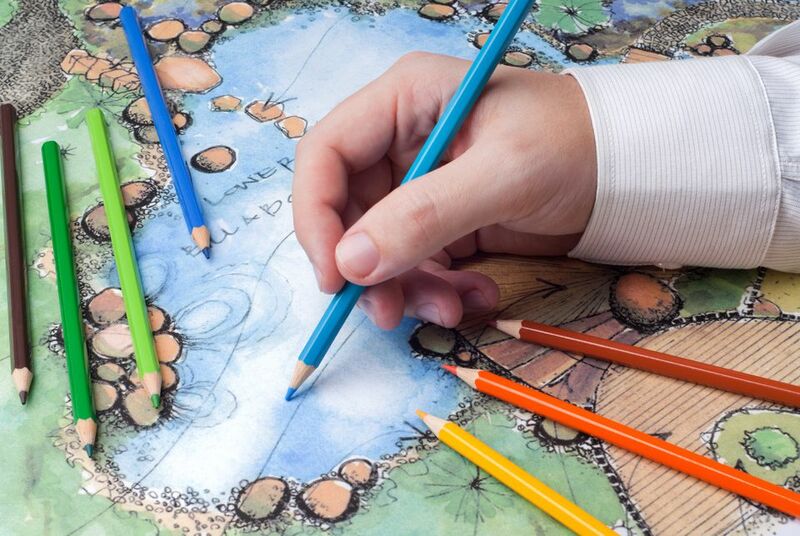 To become a landscape architect, you must have graduated from an accredited university with a bachelor's and/or master's degree in landscape architecture. Bachelor of Science in Landscape Architecture (BSLA-eligible for accreditation). States with practice acts (47) require a license to practice landscape architecture. States with title acts (3) allow anyone to practice landscape architecture, regardless of their qualifications, but only those with a license may use the title “landscape architect” or advertise as providing “landscape architectural” services. About 22,500 employees work in the landscape architecture field in the United States, according to U.S. Department of Labor in 2014; and approximately 16,400 landscape architects are licensed in the U.S. Licensure is required in all 50 states to be accurately identified as a “landscape architect” and in 47 states to practice landscape architecture. Each state sets its own requirements for licensing, but all require candidates to pass the Landscape Architect Registration Examination, or LARE. What's the Difference Between Hardscape and Softscape?